Batteries are blowing up, and I don’t just mean Samsung’s. The market is rife with potential. Computers, smartphones, electric cars, and an array of other modern industries need batteries. As a result, there’s been a huge surge in demand for key battery elements, such as nickel, lithium, and yes, cobalt. Cobalt's use in batteries accounts for 42% of global consumption. The use of cobalt in batteries has grown at a rate of 7.6% annually over the last five years. And analysts predict that by 2020, cobalt's use in battery applications alone will be greater than the entire world market for refined cobalt at the start of the decade. Tesla’s Gigafactory 1 battery plant is already sucking the metal up by the ton. And LG Chem and Foxconn Technology are building battery mega-factories of their own. In addition to mobile devices and the fast-growing electric vehicle (EV) market, there’s also substantial demand for cobalt in superalloys. Superalloys are used in high-growth markets that include the production of jet engines and wind turbines. Demand also comes from many diverse industrial and military applications, ranging from computers and communications satellites to geothermal power plants. In fact, cobalt is so integral to the defense, aerospace, and energy industries that the U.S., Japan, China, and EU have designated cobalt as a strategic metal. And despite this, they all have negligible cobalt production. 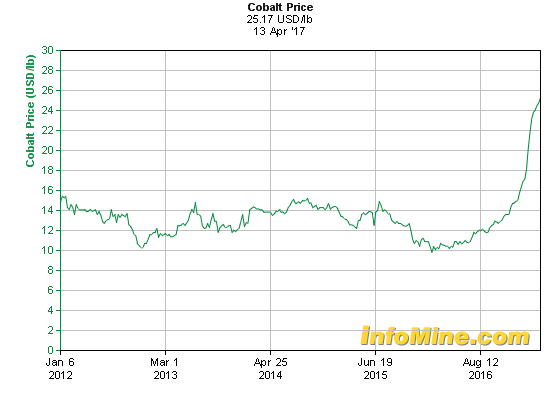 In a little more than a year, the price of cobalt has surged from $10 per pound to $25 per pound. Cobalt is a hard, shiny, and grayish metal. It’s not found as a native metal due to its low concentration (0.002%) within the earth’s crust. This means that cobalt is usually produced as a by-product of nickel- and copper-mining activities. Approximately 35% of cobalt production is copper related, 50% is nickel related, and just 15% is produced by primary cobalt operations. So, if mining for nickel and copper drops, cobalt production falls, too. The main reserves are found in the Democratic Republic of Congo (DRC). The area commonly known as the DRC copper belt holds close to half of the world’s cobalt reserves. Australia, Cuba, Zambia, New Caledonia, Canada, Russia, and Brazil account for the rest. However, it’s also important to note that while the majority of cobalt supply originates in the DRC, over 41% of its refining is located in China. China is also the largest consumer of cobalt. Other major supply sources of refined cobalt are Freeport Cobalt’s refinery in Finland, Eurasian Natural Resources Corporation's (ENRC) Chambishi refinery located in northern Zambia, Sherritt’s refinery in Canada, and Umicore’s refining operations in Belgium. Due to the DRC’s inconsistency (power and water shortages and also political and economic instability) and China’s stranglehold on refining, North American cobalt supplies are strategically important. And this is especially true now that Tesla intends to source all its raw materials from North America. The strategic advantage of having a potential North American supply of cobalt could provide substantial gains to companies and shareholders. The list of potential new sources of cobalt is large, ranging from huge new cobalt-containing nickel and copper deposits in Canada, Australia, Africa, and even deep-sea nodules and discoveries containing polymetallic minerals. Again though, the main development has been the increase in mining activity in the DRC where, until recently, significant volumes of ore and concentrate were being mined for refining elsewhere. The DRC government has, from time to time, put restrictions on the export of ores and concentrates in order to encourage greater development of downstream processing in the country. It’s also been reviewing and renegotiating mining contracts. Because approximately 85% of all cobalt production is either copper or nickel related, the actual price of cobalt is not a determining factor in the viability of most of the production sources or potential new sources. Any company looking to establish a primary cobalt operation needs to have strong economics and a strategic advantage to be able to withstand the ability of large producers of copper and nickel (with cobalt as a by-product) to increase its production. Since cobalt is normally produced as a by-product, there are few pure plays with leverage for just cobalt. Freeport-McMoRan (NYSE: FCX) and Lundin Mining (OTC: LUNMF) are the two biggest cobalt miners in the DRC. Both are highly sensitive to the price of copper and other metals while cobalt represents only a fraction of their revenues. They’re also multibillion-dollar companies, operating in several jurisdictions, and don’t represent the most effective way to play a rise in cobalt demand. The single-most leveraged high-risk, high-reward option may be the junior mining companies that saw their share prices decimated over the last few years. Companies that have managed to survive and check at least some of the boxes that we require — quality assets, competent management, a solid share structure, and ready capital — could quickly trade at multiples of today’s prices if they're able to communicate and execute their business plans effectively. One junior that stands out and merits additional due diligence is eCobalt Solutions (TSX: ECS). The company's primary asset, located in the mining-friendly state of Idaho, is the 100% owned, fully NEPA-permitted Idaho Cobalt Project (ICP). 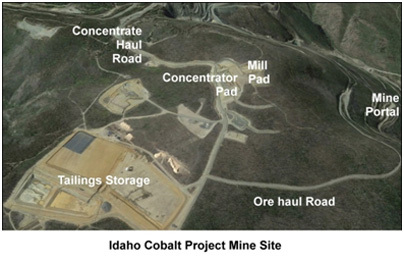 It’s comprised of the mine and mill near Salmon, Idaho, and the proposed cobalt production facility for refining ICP mine concentrate. The project is slated to produce the equivalent of 1,500 tons of high purity cobalt sulfate annually over a projected mine life of 12.5 years. Another company worth keeping an eye on (at least from a distance) is Global Cobalt Corp. (OTC: GLBCF)(CVE: GCO.H). Global Cobalt attempted to become a consolidator of cobalt projects and erroneously believed that Russia was one of the regions ready for consolidation. With Russia’s economy imploding and tensions high due to the conflict in Ukraine, the company struggled. That said, Global Cobalt does have assets worth additional due diligence (including a past-producing project in Ontario). The third microcap high-risk, high-reward cobalt play that merits further due diligence is Fortune Minerals (TSX: FT). Fortune operates the Revenue Silver Mine in Colorado and is developing the Arctos Anthracite Project in British Columbia and also the NICO gold-cobalt-bismuth-copper project. NICO is to be comprised of a mine and mill in the Northwest Territories that is going to produce a bulk concentrate for shipment to a refinery in Saskatchewan for processing to high-value products. Fortune Minerals provides upside to a number of metals that includes silver, bismuth, cobalt, zinc, coal, and copper. Any investment here should be made with a thorough understanding of the metals involved and the value each brings to their respective projects. The Revenue Silver Mine is a producing silver mine with gold, lead, and zinc by-product credits. Located in southwest Colorado, this historical 15-million-oz. silver producer has measured and indicated reserves of 16.3 million oz. of silver and inferred reserves of 10.1 million oz. of silver. The NICO deposit in the Northwest Territories contains 1.1 million oz. of gold, significant cobalt, and 12% of global bismuth reserves with by-product copper. Positive feasibility studies, test mining, pilot plants, and environmental assessments have already been completed. 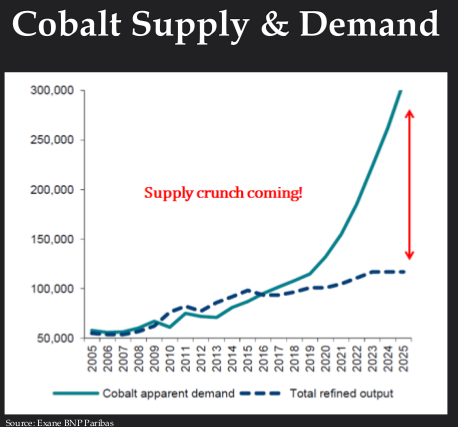 There is clearly an opportunity to profit by participating in the projected supply deficit materializing in the cobalt market. Though there are a few quality, early stage development companies in the cobalt space, the bear market of the past few years has managed to weed out companies without the ability to sustain themselves through tough times. The valuations currently assigned to the few remaining early stage companies with quality assets justify a deeper review. Whether the review is to invest in the companies as they are currently structured or to evaluate whether the companies should be restructured, there is substantial upside for first movers in the cobalt space that can present investors with clear, sustainable business models.